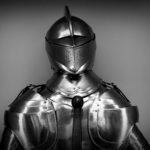 Over the past 7 years of analysing emotions, Beyond Philosophy has built up a wealth of experience on how to measure emotions and how to understand what drives emotion. However, there is no point in looking at emotion unless it drives value to your business. So with this in mind we have recently gone beyond individual client engagements to see if more generally there is a relationship between emotion and key KPIs Net Promoter® and CSAT. To do this we have developed a single emotion number called Net Emotional Value. 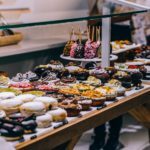 Net Emotional Value is a single number that represents how your customers ‘on balance’ feel towards you. To put it simply NEV is the net of positive emotions less negative emotions. It is slightly more complex if your business has positive attention emotions that drive value but the principle is the same. In addition we also have used this to test other value indicators such as Customer Satisfaction. Naive represents those companies with a net negative emotional feel. Transactional represents those companies with a low emotional feel overall (neither positive nor negative) – hence low on positives and low on negatives. Enlightened represents those companies with a high positive emotional feel. Natural represents those companies with a very high positive emotional feel. Note that these names also fit within the Beyond Philosophy typology of organisations based on how CE centric they are. We believe there is a direct link between emotional engagement and the degree to which the internal organisation is CE focused. 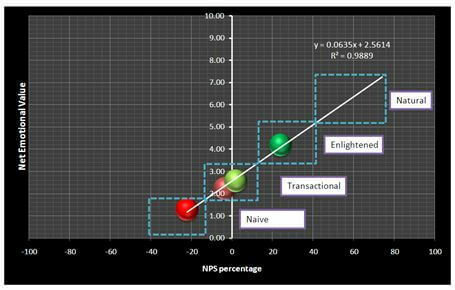 As we can see from figure 1 the relationship between the profiles and the Net Promoter® percentages holds, forming a linear relationship between NPS percentages and NEV scores. Extrapolating this line in to the zone identified as key to high growth (40% and above on NPS) we define a zone where the difference between positive average emotion scores and negative emotion scores is visually described as 5 points or above (i.e., an average of 2 out of 10 on negative emotions must be counterbalanced by an average score of at least 7 out of 10 on all positive emotions). Our conclusion is that companies driving NPS are focused on emotional engagement. 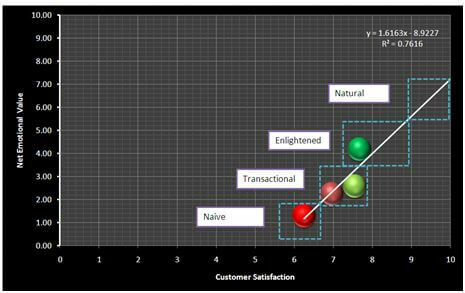 As we can see from the above figure 2 the relationship between the NEV profiles and customer satisfaction again holds a linear relationship. The relationship is less apparent than for Net Promoter® but nonetheless demonstrates continuity between growth in customer satisfaction and Net Emotional Value. Interestingly we can see that there are two transactional states where the relationship is similar. So if a company is evoking strong positive AND negative emotions this can lead to a similar rate of growth in CSAT or NPS as if the company was evoking little emotion at all! In other words, emotions need to be evoked and controlled. In addition, we also see that the move from Transactional (low emotional feel overall) to Enlightened (a higher positive emotional feel) is less about controlling negatives (which are typically already at a low level in the Transactional type – which also has low positive emotions) than about generating more positive emotions i.e., enlightened states are more positively engaged emotionally. It can be seen that the Natural state is hypothesised from this dataset as involving high positive emotions. Unsurprisingly, the dataset does not contain natural industry types (although there are types by company). Competitive confidence only allows us to express types by industry. For completion we include the Natural profile from one (undisclosed company, N=1,319). In this case, we can see that the attention emotions are pulled up to the high level of the positive recommendation and advocacy emotion sets. 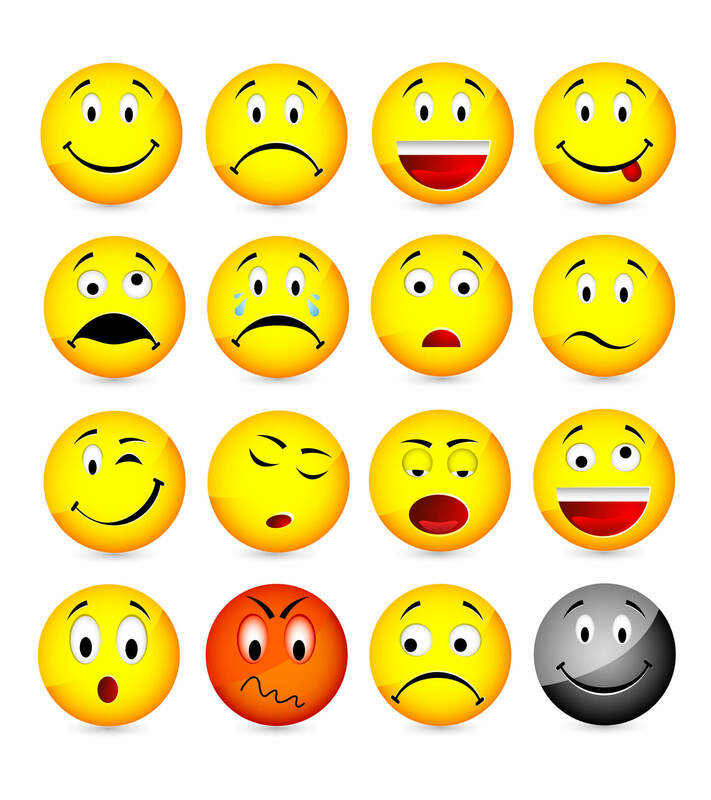 Understand your NEV score and diagnose how you can move your emotion scores higher. Steven Walden is VP Consulting and Thought-Leadership for Beyond Philosophy. Steven has 17 years Strategy Consultancy experience directing and designing strategies for major B2C & B2B firms. 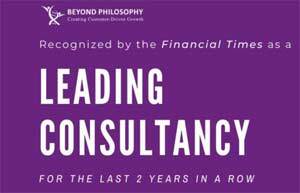 At Beyond Philosophy, the Global Customer Experience Consultancy, he is a Thought Leader and Innovator, directing engagements to assist leading firms to transform through Customer Experience. A world-leader in emotional experience his skills lie in innovation, thought-leadership, strategy consultancy and Qual/ Quant research. He is a regular speaker at conferences, blog writer, CE Trainer and international author.